Directed by Lisa & Rob Fruchtman. Opens Friday. Some documentaries might work better as print feature pieces. Sweet Dreams is the flip side of that. 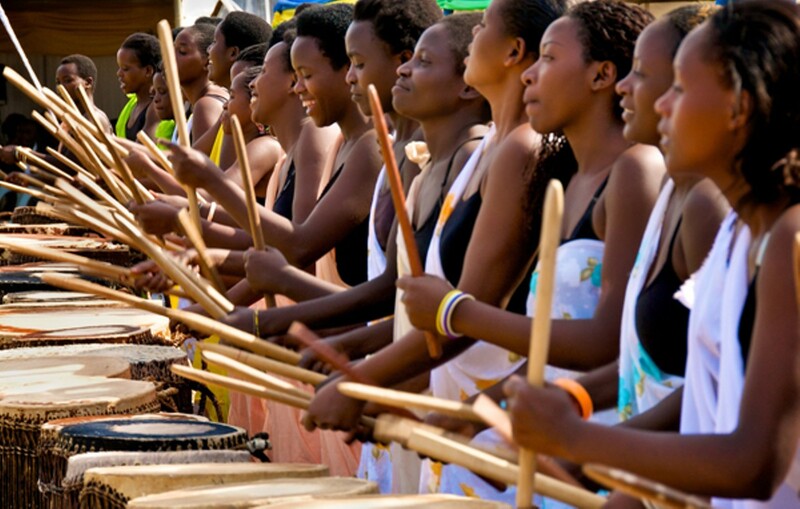 In synopsis, the story of a group of women in Rwanda forming that African country's first all-female traditional drumming troupe sounds like a rather routine human-interest feature. But when we look at the face of Kiki Katese, the director of the Ingoma Nshya troupe, and hear the life stories of her drummers in their own words, the doc takes wing and soars. In the aftermath of Rwanda's unbelievably bloody 1994 civil war and genocide, during which leftover colonial tribal animosity drove the majority Hutus to kill nearly one million members of the Tutsi tribe, Rwandan theater director Katese was moved to help begin the country's reconciliation process. 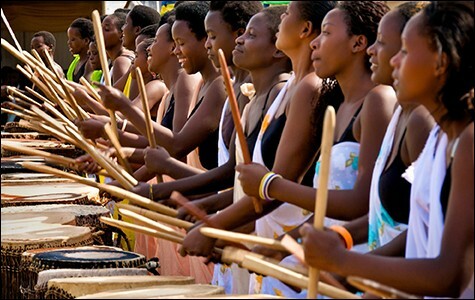 She decided to break the rules ("In our history no women were allowed to drum") by bringing together sixty women, both Hutus and Tutsis, to usher in a new era in their nation-on-the-mend. Some were widows, some were orphans, some had parents who killed. No matter, they formed a co-op and channeled their emotions into the big beat. Ingoma Nshya's raw energy has been a success. They have since toured in Europe and Africa. Filmmakers Lisa and Rob Fruchtman (she's an Academy Award-winning film editor; he's a veteran TV doc producer) keep the story grounded in Rwandan places like the town of Butare, where we meet several of the drummers and learn their individual tragedies. The profile turns sweeter, literally, when Katese makes a grassroots international business deal with the Blue Marble Ice Cream company from Brooklyn, New York, and opens the very first ice cream parlor in Rwanda — where no one had ever tasted ice cream before. The joy that reflects on their faces from the energetic music and the cool, creamy treats is a rare thing. Sweetness triumphs.